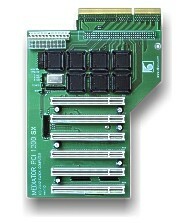 The Mediator PCI 1200 SX offers Amiga 1200 users the opportunity to use up to 6 PCI cards significantly improving the computer performance. Additionally, the new Mediator model has a Power Management Interface, which allows waking up the computer with external events (e.g. with USB or LAN signals) and shutting it down controlled by software . For simultaneous use of up to six PCI cards fully assimilated in the Amiga environment. Allows waking up the computer with external events (e.g. with USB or LAN signals) and shutting it down controlled by software. Mediator PCI 1200 SX allows access to the entire 4GB of the PCI memory space. Access to the entire PCI memory space is executed through the 8MB window in the A1200 memory space. With a hardware-supported paging mechanism, PCI memory access is executed without any slowdown compared to the linear memory access. Mediator PCI 1200 SX is compatible with all the major A1200 turbo card models. Mediator PCI 1200 SX is designed for the following turbo cards: Blizzard PPC/060, Blizzard PPC/040, Blizzard 1260, Apollo 1260, Blizzard 1240, Apollo 1240, Blizzard 1230 (III, IV), Apollo 1230, GVP 1230, Elbox 1230 and M-Tec 1230. Mediator PCI 1200 SX and PCI cards in its slots fit perfectly in the following tower systems: Winner Tower, V-Tower, Power Tower, E/BOX 1200, Infinitiv Tower, EZ Tower. Mediator PCI 1200 SX can be also installed in other Amiga towers though this may require some physical modifications of these. Included with the Mediator PCI 1200 SX is the Mediator Multimedia CD with drivers for Sound, TV tuner, Ethernet 10Mbps, Fast Ethernet 100Mbps and Graphic PCI cards.